Mr. Rao said India and China have a long history of Cultural exchanges, and many people in the cultural and ideological field have made important contributions. China has made remarkable achievements in its development. He personally looks forward to visiting Chinain the future. Maharashtra is committed to revitalizing development and hopes to strengthen pragmatic cooperation in the fields of economy, finance and aviation with China. Consul General Tang praised the Governor Mr. Rao and the government of Maharashtra for attachinggreat importance tocooperation with China. Hepointed out that this year marks the 40th anniversary of China's reform and opening up,which has proved theimportanceofemancipatingthe mind, developingthe economy, improvinginfrastructure and people's living standards. 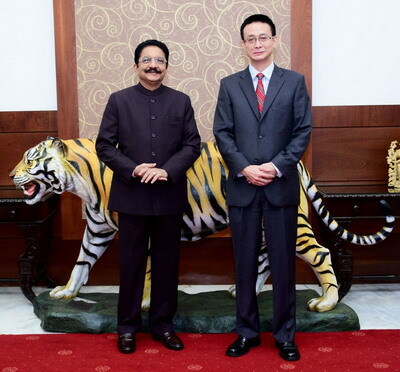 Shanghai and Mumbai are sister-cities,and the potential for cooperation between provinces of China and Maharashtra is enormous. The Consulate General will actively promote bilateral exchanges and cooperation between the two sides in the fields of connectivity, trade, humanities, and so on.